Back in 2016 AMD launched the Radeon Pro Duo, an interesting take on a semi-pro workstation card. As a dual-GPU Fiji card wasn’t going to be viable for the consumer market, AMD instead focused their attention on developing such a card for the professional content creation market, where the lack of VRAM would be less of an issue and the second GPU more of an asset. The resulting card was best geared for a niche market, but none the less an important one for the company. Until now, I hadn’t seen any real statistics on how the Radeon Pro Duo was doing in the market or if AMD would follow-up on it with newer products. 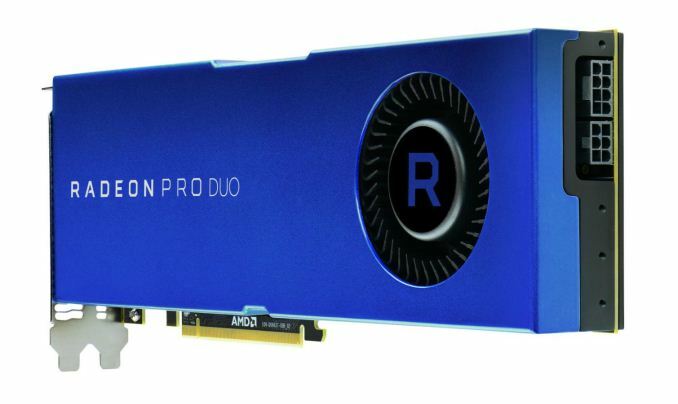 Now at the 2017 NAB Show we have our answer, as AMD has announced their second Radeon Pro Duo. This time powered by a pair of the company’s Polaris 10 GPUs, the latest Radeon Pro Duo is aimed at roughly the same market as the original, but with all of the improvements that Polaris has brought the consumer market in the past year. Even though it goes after the same market as the last Pro Duo, the new Polaris-based Pro Duo is a much different card in a number of important ways, virtually all of which have to do with the differences in features and design between the previous Fiji GPU and the newer Polaris 10 GPU. Fiji was a high-end GPU that had to be reined in a bit to fit on a dual GPU card – and even then AMD needed a closed loop liquid cooler – whereas the Polaris 10 GPUs that go into the modern incarnation have a much more workable TDP from the start. Coupled with that, Polaris 10 doesn’t have the fixed VRAM capacity of Fiji, which means AMD can significantly increase the total VRAM. As a result, the new Pro Duo strikes a very different balance than the old card. By the numbers then, the Polaris-based Radeon Pro Duo is actually slower than the older Fiji version. It has a clockspeed advantage, but this isn’t enough to overcome Fiji’s total stream processor advantage. All told, at peak rates the new Pro duo is rated for 11.45 TFLOPs of FP32, while the Fiji version was rated for 16.38 TFLOPs. In practice however I don’t expect that the gap is quite so large, as Fiji would need to throttle more often, and Polaris enjoys at least a small architectural advantage. What the new Pro Duo loses in throughput it more than picks up in VRAM. With each Polaris 10 GPU sporting a 256-bit GDDR5 memory bus, AMD has outfit each GPU with 16GB of VRAM, quadrupling their VRAM capacity. AMD’s photos don’t show the bare PCB, but I believe it to be a safe bet that AMD is running 8Gb modules in clamshell mode, meaning the board is truly maxed out. AMD argued that the smaller VRAM capacity of the Fiji based card was not a major liability last year, and while there’s admittedly no reason not to fully equip a Polaris 10 card since the company is back to GDDR5, I do think it’s an important step in making the new card more flexible. The other big change here is that the TBP has come down significantly, from 350W to 250W. Fiji was powerful, but it was also power-hungry, necessitating the original card’s closed loop liquid cooler. The Polaris Pro Duo, on the other hand, can get away with a simple blower. In fact this is the first time we’ve seen a blower-type dual GPU card from AMD in many years. And though an uncommon choice for a dual GPU card, it makes a great deal of sense given the card’s professional workstation market, as blowers are expected there, and the Radeon WX cards are already similarly equipped. Under the hood – and particularly catering to the NAB crowd – the move to Polaris means that AMD can now support DisplayPort 1.4 and HDMI 2.0b a significant step up from DP 1.2 and HDMI 1.4b on the previous card. Besides natively supporting contemporary HDMI and HDR displays, this means that AMD can now also drive 8K monitors using a dual-cable setup. All told, the new card comes with 3x DP 1.4 ports and a single HDMI 2.0b port, and can drive all 4 ports at once. With their new card AMD will be going after the same content creation niche as the old card, which means a mix of video production and VR. The latter in particular is still a growth market for AMD, and the card’s two GPUs means that developers can take advantage of AMD’s Affinity Multi-GPU technology with only a single card. Though to be sure, AMD is positioning and promoting this more like their Radeon WX professional cards, so like its predecessor, the new card will get AMD’s pro drivers and limited official support for the major CAD, CAM, and other engineering software packages. 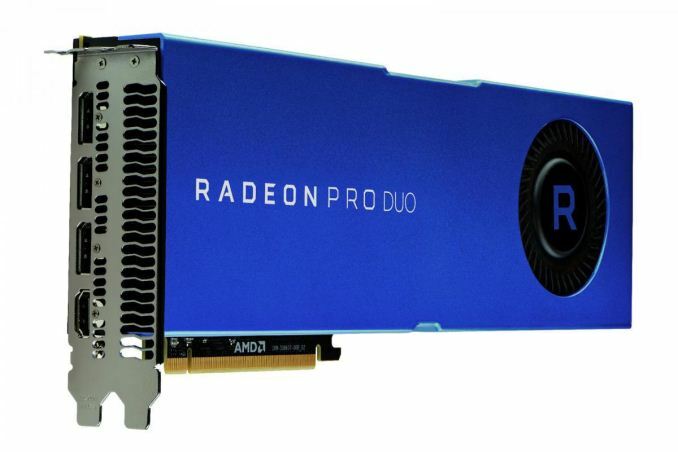 Wrapping things up, the Polaris-based Radeon Pro Duo will be launching next month at $999. For the moment at least, this puts it at the head of AMD’s professional cards, at least until a WX Vega card finally shows up.
" the TBP has come down significantly, from 350W to 250W." It should be able to drive three 8K@30 Hz monitors, three at 8K@60 Hz using DSC or a single 8@60 Hz with out compress (dual cable).